We celebrate Independence day with hardly any real understanding of how people who actually lived through the event felt. The day is historic and there are a million such stories of micro history which are sobering reminders how people felt. My Aji (grandmother) turned 82 last month, while an independent India turns 66 tomorrow. The date 15th August raises a lot of memories for her. Her mother was a political activist who had been jailed many times for her role in the struggle for freedom. She has in the past vividly described her visits to her mother in Nagpur’s Central Jail as a child. She had grown up knowing relatives who were political activists and often were either on the run or were imprisoned. So when Independence Day arrived, it was a day of great hope and relief for the sixteen year old. Hope for a country and relief for knowing that her near and dear ones were now safe. Last year my sister while talking to Aji, asked her to write down in a notebook her memories of the first Independence day. She obliged. She narrated it to my mother on the phone today and I typed it out. Do excuse my rusty Marathi typing. There is also an English translation at the end. मी तर त्याच घटनां मध्ये अगदी रमून गेले होते. नेहमी प्रमाणेच १ ५ ऑगस्ट उजाडला आणि माला एकदम १ ९ ४ ७ च्या चौदा ऑगस्ट मध्ये घेऊन गेले . अकोला नागरी नववधू सारखी सजली होति. ठिकठिकाणी कमानी माळा , पताका लावल्या होत्या . लोकांनी घरांवर, दुकानांवर , काचेर्यानवर रोशनाई केली होति. १ ५ ० वर्षांनी भारत स्वतन्त्त्र होणार होत. पारतंत्र्याच्या बेड्या गळून पाढणार होत्या . देश मोकळा श्वास घेणार होता . आमच्या घरालातर सणाच – उत्सवाच रूप आल होत . माझी आई कै . सौ . प्रमिला ऒक तर तीन चार वेळा जेल यात्रा करून आलेलि. माझा चुलत भाऊ केशव, माझे थोरले काका बापूसाहेब, माझी मधली काकू- राधाकाकू , माझ्या मावशीचे यजमान श्री . अप्पासाहेब कुलकर्णी, हि सर्व मंडळी मुक्त झाली होति. त्यांनीही स्वंतंत्र लढ्यात उड्या घेतल्या होत्या , कारावास भोगले होते. सर्वांच्या आनंदाला पारावर नव्हता . मी तेव्हा Fergusson College hostel मध्ये 1st year ला होते . आईनी आमच्या Rector-ना पत्र पाठवून माला आकोल्यास बोलावून घेतले होते . त्या ऐतिहासिक दिवशी आम्ही सर्व एकत्र असाव अशी तिची इच्छा होति. आमच्या rector -नेहि परवानगी दिलि. मी १३ ऑगस्टला दुपारी साडे अकरा वाजता आकोल्यास पोहचले. सर्व घरभर आनन्दिअनन्द होता. काकांनी मला आईकरता गुपचुप एक सुंदर खादीची साडी आणायला सांगितली. ती त्यानी त्यांच्या कापतात ठेवली . आईने मलाहि साडी आणली. बाबाला नवीन कपडे, उमाबाईना साडी – सर्वाना सणासारखे नवीन कपडे मिळाले होते. चौदा तारखे पासूनच कार्यक्रमाना सुरुवात झाली होति. आमच आंगण व्यवस्थित सारवून, त्यावर सतरंजी जाजम गालीचा घातला . कडेकडेनी खुर्च्या ठेवल्या होत्या. दसर्यालाही असाच थाट असे . नागरिकांच्या सभा, झेंडावंदन इत्यादी भरगच्च कार्यक्रम होते . आईच्याहस्ते दोन – तीन ठिकाणी झेंडावंदन झाले. चौदा तारखेला रात्री साडेसात – आठ वाजता, आमच्या घरी मंडळी येउ लागली. मित्र-आप्त सर्व आली. मोठी मेजवानी होती. बासुंदी – पुरी, मसाले भात असा बेत होता . जेवणा पूर्वी काकांनी आईला साडी दिलि. मी तिला लगेच नेसायला सांगितली . ती सुरेख पंढरी साडी – परवता सारखे काठ असलेले , कानात मोत्याची कुडी , गळ्यात मंगळसूत्र – असा साधाच पोशाख – पण आई खूप सुंदर दिसत होती . तीन्हेही काकाचं औक्षवण केल. आणि जेवताना काकांना कोर चांदीच ताट मांडल. तिने ते आधीच आणल होत . सरवाना फार कौतुक वाटल – It was a token of her appreciation and love for my father – for what he had done for her. गप्पा गोष्टीत वेळ गेला. बारावाजता सर्वांनी नेहरूंच भाषण Radio वरून ऐकल. कानात सर्व प्राण आणून ऐकत होतो. मग साडेबारा पासून झेंडा वंदन, सभा, भेटी – पाहते तीन-चार वाजे परयन्त चालू होत. १५ ऑगस्ट ला आम्ही सर्व मळयात आजीच्या पाया पडायला गेलो. आजीने स्वतः आईला हार घातला, मिठी मारली. सर्वाना आनंदाश्रू आवरेनासे झाले. सर्व वडील मंडळीना भेटून आलो. दिवसभर ‘वन्दे मतरम ‘ कानावर पडत होते. माझ्या आईनी आमच्या सुभद्रा वाहिनी करताही एक सुरेख खादीची नौवार साडी आणली होती. ती नेसूनच त्या जेवायला आल्या होत्या. दोन दिवस धामधुमित गेले. मी १७ ऑगस्टला निघाले – १ ८ ला – Hostel वर परतले. तरी पण कित्येक दिवस त्या आठवणी मनी दाटून येत होत्या. पुढे आईचा स्वर्गवास – माझा विवाह – जमशेदपूरला आमच वास्तव्य. १९५८ मध्ये आम्ही टाटांच्या बंगल्यात – राहायला गेलो. बंगला मोठा होता. चारी बाजूस आवार होते. तिथे वारांद्याथून बाहेर अंगणात जाताना मी एक मोठा बांबू लावून घेतला होता. त्या १५ ऑगस्टला मी माझ्या घरी प्रथमच झेंडा वंदन केल. काही वर्ष तरी झेंडा वंदन करत होतो. पुढे पुढे हि प्रथा बंदच झाली, झेंडा वंदन गेल, वन्दे मातरम हि गेल, पण १५ ऑगस्ट आला कि त्या सर्व स्मृती जाग्या होतात आणि आई, काका, बाबा सर्वांची खूप आठवण होते. आता हे सर्व अरूंनधतीला वाचून दाखवायचं आहे. तिच्या मुळेच मी हे लिहिले. Thank you, Arundhati. A couple of days ago Arundhati called me. While talking on the phone she asked me what I was doing. I told her I was recalling my memories of 1947 and our first Independence Day. She told me to pen down these memories so she could read them later. I was lost reminiscing about those old days when 15th August dawned and it took me back to 14th August, 1947. Akola, my hometown was adorned like a bride! Everywhere there were decorative arches and garlands. People had lit up their houses, shops and offices with rows of twinkling lights. After a 150 years – India was going to be free. The chains of British rule were to be broken. The country was going to breathe the air of freedom! There was an atmosphere of festivity in my house too. My mother Pramila Oke, had been to jail 3-4 times. My cousin Keshav, my uncle Bapusaheb, my aunt Radha Kaku, my maternal aunt’s husband Appasaheb Kulkarni, all had been fighting for freedom and were free today. Everyone’s joy knew no bounds. In those days, I was studying in Pune’s Fergusson College and staying in the hostel. My mother wrote to the hostel Rector to allow me to visit Akola. She wanted all of us to be together on that historic day. The Rector gave us permission and on 13th August, 11.30 am I reached Akola. Our house was drenched in joyous celebrations. My father had secretly asked me to buy a beautiful Khadi sari for my mother which he hid in his cupboard. My mother had bought a new sari for me, clothes for my brother, a sari for our cook Umabai – We all got new clothes just like we did during a festival. From the 14th, the celebrations started. Out courtyard was covered with mats and carpets – chairs arranged around in a big circle – just like we would do during Dussera. There were many programs scheduled – meetings, flag hoisting ceremonies and more. My mother was invited as a chief guest to few flag hoisting events. On 14th evening by 7.30 – 8.00 people started streaming into our house. All our friends, near and dear ones arrived. A big feast was served complete with basundi-puri (sweet) and masale bhaat (a rice dish). Before dinner, my father presented my mother with the sari which I coaxed her to wear immediately. A beautiful white sari made of khadi with a temple border – pearl earrings, mangalsutra all very simple but my mother looked beautiful! She too presented a silver plate to my father which she had bought earlier. It was a token of her appreciation for what he had done for her over the years. Time flew by, with us chatting and exchanging news. At the stroke of midnight we surrounded the radio, listening to Pandit Nehru’s address to a free nation! From 12.30 am onwards, there was a flag hoisting done, meetings were held, speeches made and celebrations continued till 4 am in the morning. Later in the day we visited my maternal grandmother at her farmhouse and took her blessings. She garlanded and hugged her daughter – a very emotional moment for all of us. The whole day slogans of ‘Vande Mataram’ echoed in our ears. Subhadravanihi, another friend and a freedom fighter, came for lunch dressed in a nine-yard khadi sari which my mother had presented to her. Two days of joy passed in a hurry! I left on the 17th and reached my hostel in Pune on 18th August. For many days my mind would hark back to those wonderful memories. 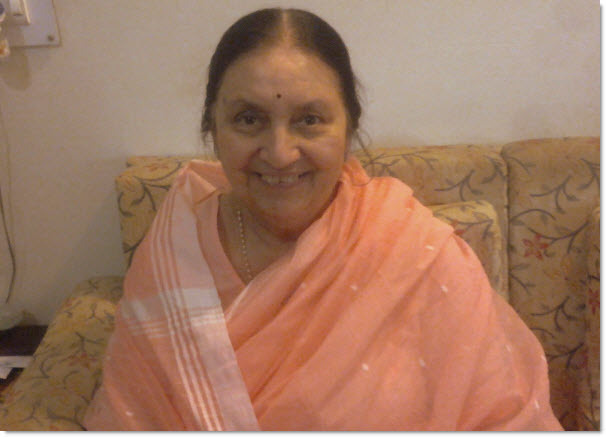 Soon my mother passed away, I got married – we settled in Jamshedpur. In 1958, we shifted to a company (Tata) bungalow which was spacious with a large garden. In the courtyard that year, I hoisted the national flag in my own house for the first time. I felt proud and overwhelmed. As years went by, we stopped the practice of flag hoisting, but still every year when 15th August dawns, all those beautiful memories of my parents, my brother, our celebration come flooding back. Thank you Arundhati, for making me write this down. *Special thanks to Ai (Mom) for help with the translation. Some memories never lose their colour. I only hope one day mine are as vivid as your Grandmother’s! She’s sounds like an amazing person. You and your family are truly blessed. Thank you for your comment. Yes, I am lucky indeed to have my grandmother tell me of such memories so vividly. Love historical memories, all the small things we would never realize without accounts like this! Many many thanks dear Aditya n Arundhati, because of you both Aatya has brought back lovely memeories. I have grown up hearing the lovely hair raising stories about our independence from ur grandmother, my father-Baba, Neela-aatya and her father Pappa. We also have the carpets woven by my grandmother late Pramilatai Oke and today after reading ur post I definitely feel very very proud to be the granddaughter of Smt Pramilatai Oke. Keep pressuring ur grandmom to tell more such stories, she has many many more experienes and memories of freedom struggle. U can keep posting them and may be one day u can publish a small book authoured by Smt. Lata Paranjpe. All the best and indeed a very good job. It is nice to see your comment here :-). Actually Aji has written down some some memories but I doubt she wants to have them published – anyways this one was special and fun to recreate in the form of a blog post. Worli. Mumbai 18. October 1, 2013. Aditya, I saw these only now though I have been hearing about it from Pratima. I enjoyed every line of it. Biju [ that is how some of us called your grandma Lata] alwys had an inspiring poetic mind and heart. Also a sharp memory and a sense of pride and contentment about life. All is reflected here.I was in Pune , not Akola that day. But I can vividly imagine all that she has written. Let us have more such from her . Thanks for your wonderful comment. I will surely get this across to Aji.